As an Aussie member, who has little interest in your local members personal chat, much of the posting re braiis etc on the forum is not relevant, but I regularly scan the digest for matters Syncro, as you are a good source of technical info and parts - I have bought the Big brake kit and several smaller pieces from your members. While I can see that members should be encouraged to participate by posting, I wonder what is the problem with lurkers? Do they affect the forum negatively? Is the information shared here so valuable that it should be locked away? I am a member of 5 other Syncro/ Bus forums and I am not aware they limit their membership. I think if it ain't broke don't fix it. Not everyone is tech savvy enough to feel comfortable using the forums, but they definitely use the information posted. If it was up to my husband you would never see us - he just doesn't do typing. :lol: It's a great forum, it works, and I think classifieds are a good hook to get folks interested in returning often. Just maybe do more to engage users by PM occasionally - I always check my PM if I get notifications, or if there was a newsletter / paragraph occasionally that would also be cool. Thanks for the opportunity - I love the forum. I am not totally against screening but it should be minimal. As someone already posted, if you limit membership to just active members, all you will have is a cosy little club and surely that is not what we are about. As Russell said, usually only 10% of members on a forum are active. That is just the way it is. Trying to get people to be more active by whatever means is usually pointless. People will participate if they are that way inclined, or they need to or they want to. Some people will actively read every day but at this stage feel they have nothing to contribute. Others may lurk here for a year and then decide to buy a Syncro and become active. For those of you whose business revolves around Syncro's the more members, active or inactive, the better. There must be lots of guys who never post but know who you are by being on this forum. Yes there are some downsides regarding people being able to access ideas etc. For example. pictures and details of my tanks are all over here and some body might just decide to copy that for himself or his business. That is impossible to stop and usually if you try you just damage yourself further by cutting yourself off from other possible clients. If your workmanship is good and prices reasonable you have little to worry about in any event. Lets not be paronoid about this and also lets accept that not everyone will be active members all the time. We should be an open, accepting, happy community, just like the vehicles we support! VW is the "peoples car" after all. This is not a forum for Soviet era Zils or Gaz's! You can not force activity. 10 usless posts will frustrate the activ interested. Dont underestimate the number of "Shy" people who do not want to expose theyer lower tecnical knowledge by asking easy questions, or theyer lower laguage knowledge. Shure some Garages can loose a customer because he got informed here. But propper Garage can compensate easy with expirience. And that is what shuld count. I can appreciate the need for a minimum post count before accessing classifieds etc. as most forums seem to require a "full" registration as a way of weeding out spambots and would-be used car dealers. Being in the UK, I'm defo one of the occasional posters but...without this forum and the help of some very knowledgable members my 2.6i would probably still be stuck in a corner, sulking! Just read Bob T's post. That's exactly what I'm talking about. His question about lurkers is spot on. I'm not sure what the motivation is for limiting access. Either you feel it will encourage more active participation, (which it won't) or there is some paranoia about people having access to info or ideas which is what the web and forums are about anyway. When I responded to an ad for a Syncro, Dean encouraged me to join the forum, which I did. I don't have one but want one. I will not take the first, bus offered to me and will do my homework. By "lurking" I can at my own pace decide what it is I want and when. How do you think you will encourage people to get involved or become part of this community if you force them? I have seen on Aircooled forum where people are more concerned about how many posts they have made and how long it took them to do that, than with the content or purpose of the forum. There too, the wanted to block everybody and caused more bad than good. If you're really just interested to have 5 members, BBM each other. What harm does "lurking" do to this forum? How about this for a suggestion, we send everyone a pm stating that they must please introduce themselves so we know who is who and what vehicle you drive etc, if you are looking for a syncro let us know, post a wanted add, some other lurkers out there may want to sell there syncro's and that way you can find what you are looking for, there are also a few of us who trade in syncro's but i do not always put everything i have for sale on the syncro site as most people her are syncro owners already, that said i have sold 2x syncro's to guys who have already got syncro's and wanted a 2nd vehicle. its is not about post numbers but about being involved, this is a very hard call to make as the forum moderators and that is why we have had a poll about it, we also had long and hard decisions about this, there is no point in having 10 000 members that do nothing, rather have 200 that are involved. but i must say this topic has at least brought a few lurkers out, and maybe they will participate a little more now, lets get everyone involved. this is still a growing forum that has outgrown our expectations by 100% so lets keep it going with participation from all. there was a lot of resistance to the"new" ie this forum from a lot of the old forum members but a few have come across and are participating here as well as there as a lot of us do. The forum is her to benefit us all, even if your contribution is small and is a tip on some thing you bought for camping that is great or a waste of time . let us know. 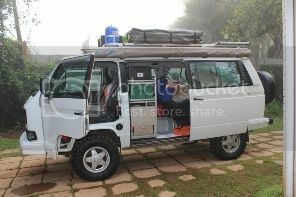 for example on that, i have a customer, elderly gentleman that built his own camper module for in his syncro with water heaters and basins, pull out kitchen and storage etc the materials to do this cost him in excess of R45k, surely everyone would like to see what he did etc, but he is the lurker type so unless id the the post you will never see it, and it is an awesome set up for 2x people. In my opinion knowledge is supposed to be free to "Lurgers" also. Power of knowledgekeeping is not productive to enyone. The Garage is having good Customers if they do propper job and NOT hiding truth or Knowledge. Better Service to the costumers, sorting out thous garages who cheat and steal is the Job of the serious Garage ownwers. The reputation of the Garages need improofement. This forum shoud be for the interested People and not for nice cheep atvertisement of professionals who can not get costumers through good reputation. Eugene Wrote: When I responded to an ad for a Syncro, Dean encouraged me to join the forum, which I did. I don't have one but want one. I will not take the first, bus offered to me and will do my homework. By "lurking" I can at my own pace decide what it is I want and when. How do you think you will encourage people to get involved or become part of this community if you force them? I have seen on Aircooled forum where people are more concerned about how many posts they have made and how long it took them to do that, than with the content or purpose of the forum. There too, the wanted to block everybody and caused more bad than good. If you're really just interested to have 5 members, BBM each other. It's really time for you to buy a Syncro. Anyway, I feel that at least everyone that joins should do an intro and specify their location. It's nice to know that if you are in a certain area that there are Syncro people that could help if you run into trouble.